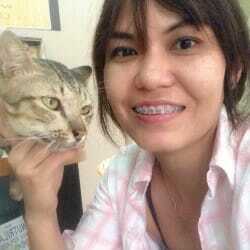 My name is Tina, I am of German origin and live in Thailand for almost a decade. 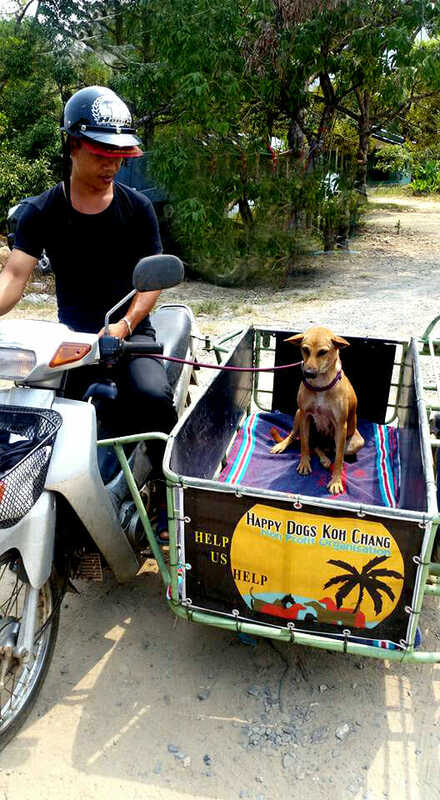 Ever since I am here, I am caring for those that have no voice and so in 2012 I founded Happy Dogs Koh Chang to reach out to animal lovers worldwide hoping for help and support. My main goal is to spay and neuter stray dogs and cats to control the population an ethical and humane way. Relying entirely on donations, I need help and support from animal lovers such as yourself. Still believing in miracles… sometimes wonders are going to happen and maybe one day someone with the same compassion but also a corresponding bank account comes along, willing to pre finance the start up, so that the necessary all can be done to build a legal, charitable not for profit dog rescue with enough money left to build an appropriate, safe shelter and being able to employ a vet and few regular staff, to keep the dogs of Koh Chang alive, safe, happy and healthy and from where finally, the so badly needed mass spay/neuter programs can be organized. Meanwhile I am still here, doing what I always did, helping and saving dogs in need, where I spot them and as long as I am able to. I am always very happy to see more and more people to join in and giving HDKC a FB like and supporting us with money, donations in kind, food, treatments, fostering, sponsoring, adoptions…the list goes on and on! Making KC a better place for dogs and cats, relieve the suffering and pain of the animals on the island and to stop the barbaric and common poisoning through sterilization and care, was my main intention to start the project. As an organization founded purely from heart & compassion for the countless number of suffering strays on the island- I might have been naive, to highly underestimate the invincibly of most the hurdles, obstacles and stumbling blocks on my way to legalize such mission by becoming a registered by Thai law, charitable organization, I have just quietly continued what I always did and do ever since I am in Thailand; feeding the starving, give medical help and take the one in need to the vet and pay for it. First and foremost the mission is to help the dogs and cats that no one cares for. Spay and neuter, feeding, treating, healing..1st. aid for the sick and injured… But on the long run the aim of building and establishing a shelter for the neglected and abandoned and all those who need foster and ideally finding new. caring and forever homes is one of the priorities I have in mind and where I am continuously fighting for..
Keeping the population of stray animals on the island down by means of the realization of humane spaying and neutering programs, was and still is a major priority to start with. Giving vital, life-saving treatments to sick and injured animals, I continuously will do, as far as I can. 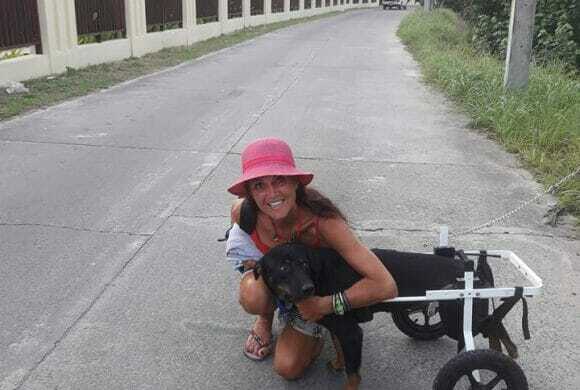 Martina Moeller is the founder of Happy Dogs Koh Chang. John is a friend for years and as a huge dog lover, he has adopted 3 strays and feeds about 35 dogs daily in his neighborhood. 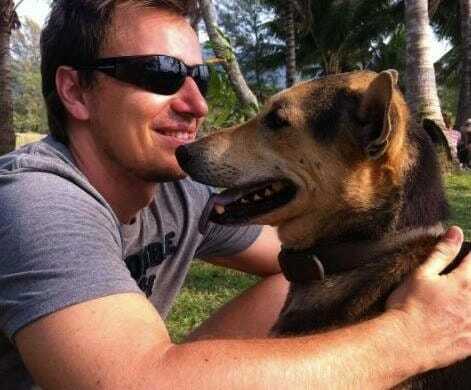 John is full time self employed but helps transporting dogs with his Salaeng when ever his time allows. Pah Duan is from Thailand. 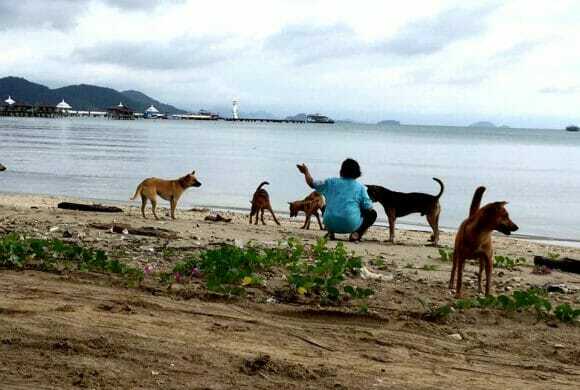 This lovley Lady looks for the strays on the Bang Bao Tempel and also for the strays on the Beach. We help her if she needs it with food and spays. We feed about 200 Dogs a day! Tina, you are an angel!!! Special huge respect for people like you all over our fucked up planet!!! Thank you Tina for your great work!!! Thank YOU for what you are doing every day! Oh Gott ist das toll. Hab gleich Tränen in den Augen. Du leistest echt großartiges! Tina, Du machst das wirklich toll. Ich konnte mich selber davon überzeugen. Es war eine wunderbare Erfahrung bei Euch helfen zu dürfen. Ich kann das Projekt nur weiter empfehlen. Happy Dogs Koh Chang ist wirklich seriös und voller Liebe und Leidenschaft für die Tiere geführt.